Rail transit is an area where California could learn a thing or two from Japan, according to State Sen. Kevin De Leon. The California State Senate president pro tempore got a first-hand look at Japan’s high-speed rail network as a member of an official delegation to Japan this spring. 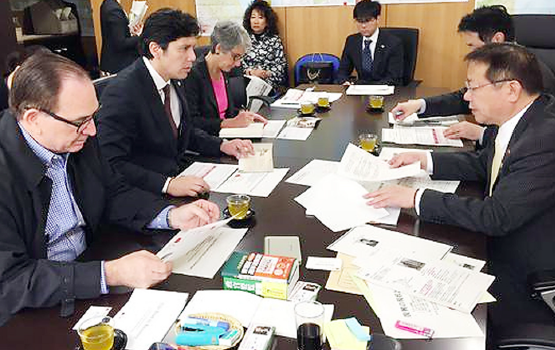 The California Senate sent its 16th official delegation to Japan from March 26 to April 4 at the invitation of the Japanese government in order to sustain and grow the positive economic, governmental, cultural and educational ties between the two regions. The visit is the first since the creation of the Japan-California Legislative Caucus (JCLC) by Upper House members of the Liberal Democratic Party of Japan in June 2014. De Leon, whose district includes Little Tokyo, Chinatown, Thai Town, and historic Filipinotown, said there are many things California can learn from the Japanese as work continues on the first segments of a high-speed rail network in the Central Valley. “When it comes to public transportation, the Japanese are much more advanced than we are in America. Especially when it comes to rail, whether it’s subways, trains or high-speed rail,” De Leon said in an interview with The Rafu Shimpo. He marveled at the safety record of the Shinkansen, Japan’s bullet-train, which hasn’t had a passenger fatality since its opening in 1964. The California delegation toured a high-speed operation center and met with officials from East Japan Railway Company. The delegation also traveled to Kobe, site of the Great Hanshin Earthquake in 1995, to discuss earthquake preparedness and emergency management. De Leon was elected president pro tempore of the State Senate by his peers last year, becoming the first Latino to hold the position since 1883. In 2012, De Leon helped to secure a $5 million grant for the Budokan of Los Angeles gymnasium from the state’s Parks and Recreation Prop 84 program. Renewable energy is an area where California leads Japan, according to De Leon, who in February was among a group of senators to introduce a package of proposals to reduce greenhouse gas emissions and spur growth in the state’s clean-energy economy. “They’re much more advanced than we are when it comes to transportation, but when it comes to renewable sources of energy, California is much more advanced than Japan is, whether it’s solar or wind. 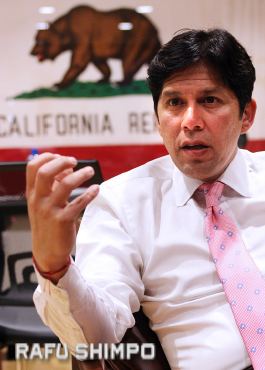 California is a world leader of renewable sources,” De Leon said. He noted that following the 2011 disaster at the Fukushima nuclear plant, Japan shut down all of the nation’s 43 nuclear reactors. The Sendai Nuclear Power Plant in Kyushu recently became Japan’s first nuclear power plant to be given permission to restart its reactors. De Leon praised Little Tokyo for initiating renewable energy initiatives through programs such as Sustainable Little Tokyo. 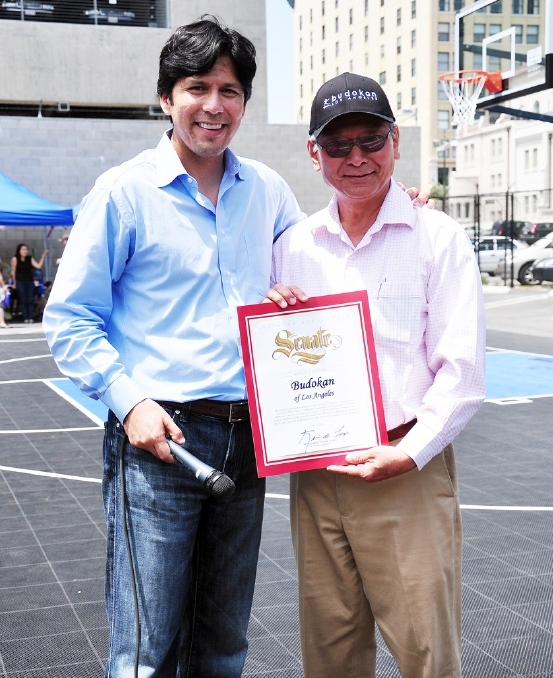 De Leon joins former Little Tokyo Service Center executive director Bill Watanabe at a ceremony for Budokan in May 2012.